King & Shaxson Ethical has been managing ethical portfolios since 2002, meaning we know what it means for clients ethics to be reflected in their portfolio. We are a division of King & Shaxson which is part of the Phillip Group, a global company that employs over 3,500 people worldwide. The personal discretionary service is available to individuals, Trusts, Charities and institutional clients. This portfolio is highly personal and is tailored to each client, made possible via our extensive value based questionnaire (min £250,000). 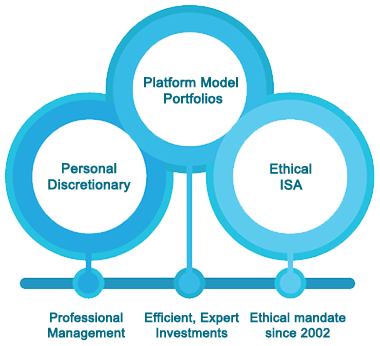 Our Ethical model portfolios were launched in February 2010 and can be accessed through various platforms. Clients can invest in a number of ethical model portfolios ranging from Cautious to Adventurous. Available via our discretionary portfolio service, our ethical ISA can provide a tax efficient investment wrapper for investors meeting the Personal Discretionary minimum portfolio size. PhillipCapital UK Ltd (Company Number: 2863591) and King & Shaxson Limited (Company Number: 869780), a member of the London Stock Exchange, are companies registered in England and are a part of the PhillipCapital Group. The Registered Office for both companies is 1st Floor, Cutlers Court, 115 Houndsditch, London, EC3A 7BR . By accessing and/or using the [www.kingandshaxson.com] website and any pages thereof (referred to as ''this Site'' hereinafter), you acknowledge that you have read and understood the following important legal information and that you agree to the terms and conditions set forth therein. If you do not agree to all of the following terms and conditions, do not access or use this Site. The information and services provided and described on this Site are not intended for distribution to, or use by, any person or entity in any country or jurisdiction where such distribution or use would be contrary to applicable local laws or regulations or would subject King & Shaxson to any registration requirement within such country or jurisdiction. Persons or entities in respect of whom such prohibitions apply must not access or use this Site. This Site is reserved exclusively for residents of the United Kingdom and should not be accessed by any citizens or residents outside of the United Kingdom. The information contained in this Site does not constitute an offer to buy or sell securities of any type. Nothing in this Site should be construed as an offer or the solicitation of an offer to purchase or subscribe or sell any investment or to engage in any other transaction. Furthermore, by offering information, products or services via this Site, no solicitation is made to any person to use such information, products or services in jurisdictions where the provision of such information, products or services is prohibited by law or regulation. Products and services mentioned or described in this Site may not be available to or suitable for you. You should consult an investment and/or tax advisor concerning your financial situation and tax obligations before making any investment decision. All information contained in this Site has been prepared by King & Shaxson on the basis of publicly available information, internally developed data and other sources believed to be reliable. It is for general information purposes only and should not be considered an individualised recommendation or personalised investment, tax or legal advice. The information is subject to change without notice. Reasonable care has been taken to ensure that the materials are accurate and that the opinions stated are fair and reasonable. All opinions and estimates constitute our judgement as of the date of publication and do not constitute general or specific investment advice. All numbers are unaudited unless otherwise stated. Furthermore, please note that King & Shaxson and/or its affiliates and employees may have interests or positions in relevant securities or may have a relationship with the issuers. King & Shaxson does not warrant the accuracy of the information and materials provided herein, either expressly or impliedly, for any particular purpose and expressly disclaims any warranties of merchantability or fitness for a particular purpose. King & Shaxson will not be responsible for any loss or damage that could result from interception by third parties of any information made available to you via this Site. Neither King & Shaxson, nor any of its affiliates, directors, officers or employees, nor any third party vendor will be liable or have any responsibility of any kind for any loss or damage that you incur in the event of any failure or interruption of this Site, or resulting from the act or omission of any other party involved in making this Site or the data contained therein available to you, or from any other cause relating to your access to, inability to access, or use of the Site or this information and materials, whether or not the circumstances giving rise to such cause may have been within the control of King & Shaxson, any entity of the PhillipCapital group, or of any vendor providing software or services support. In no event will King & Shaxson, its affiliates or any such parties be liable to you for any direct, special, indirect, consequential, incidental damages or any other damages of any kind even if King & Shaxson or any other party have been advised of the possibility thereof. As a result of money laundering regulations additional documentation for identification may be required when you make your investment. Details are contained within the relevant documentation. Data Protection King & Shaxson process and store personal data in accordance with the requirements of the Data Protection Act 1998. Any personal information supplied will be used primarily to answer your enquiry or to fulfil any of our contractual obligations to you. Personal data will not be held longer than is reasonably necessary. Consequent upon the way we organise our business, personal data may also be used for operation and administrative purposes; and may be shared with companies within the King & Shaxson group and the PhillipCapital Group. Personal information supplied by you may on occasion be used for research and analysis purposes and to send you information on products and services that may be of interest to you. Personal information will not be released to non-associated third parties unless there is a legal or regulatory reason to do so or unless the third party fulfils a service on our behalf. On occasion our legal, contractual or organisational obligations may require us to release information to countries outside the European Union, which may not provide the same level of protection for personal data as within the EU. However we will take steps to ensure that whenever personal data is within the control of King & Shaxson their associates or agents it will be afforded protection. This Site may contain or be linked to advice or statements of third parties. King & Shaxson makes no representation as to the accuracy or timeliness of such information, has not and will not review or update such information and cautions you that any use made of such information is at your own risk. Copyright and all other rights of the entire content of this Site are reserved by King & Shaxson. You may download or print out hardcopies, provided that you mention the source used. Nothing on this Site shall be construed as granting any license or right to use any image, trademark, service mark or logo on this Site. No act of downloading or otherwise copying from this Site will transfer title to any software or other material to you. All other use, in particular reproduction (in whole or in part) and publication requires the prior written consent of King & Shaxson and acknowledgement of source.